The lands of the Ninth World are vast and filled with the leftover marvels of the prior worlds. But the ancients didn’t live and work their strange ways only upon the land, and the secrets, treasures, and deadly dangers of the past also lie beyond the vast horizons, and beneath the foam-flecked waves, of the Ninth World’s great ocean. Ancient ruins? Treasures? Gods? Any of these, and rewards yet unimagined, may await discovery for those willing to leave the comforting familiarity of dry land and accept the ocean’s cold, dangerous embrace. Secrets of the strange Queen of All Octopuses, her temple-palace of coral, and the unique technology of her kind—along with dozens of other wondrous locations and items. Details of the mysterious invisible corridors that allow surface dwellers to breathe and operate at any depth—if they can find and navigate these pathways. 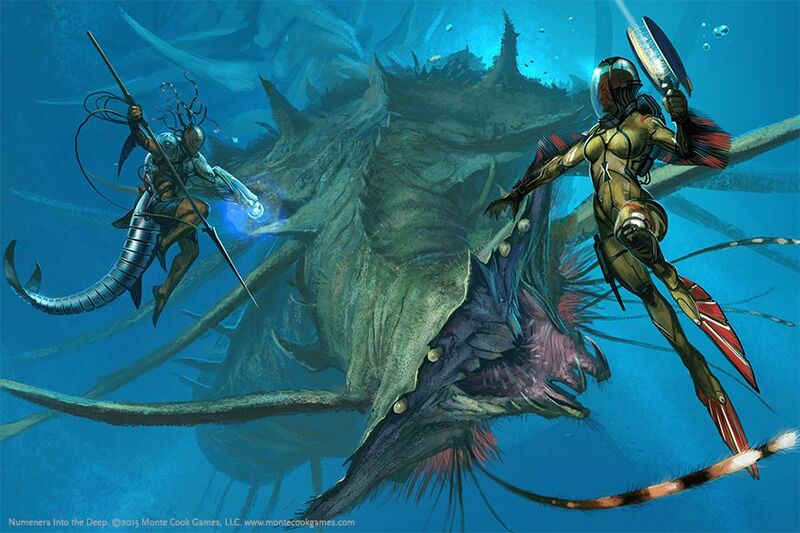 Plus other new modes of transportation to take characters out to sea and beneath the waves. Exotic and fascinating environments to fill your players with wonder and take your adventures to unique and breathtaking realms! I really enjoyed Into the Deep with its tense, diverse and and wondrous locations. 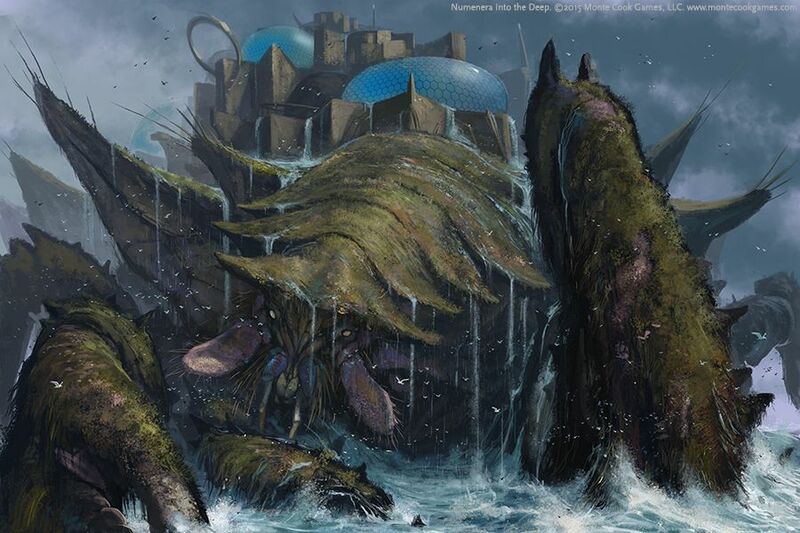 The set pieces themselves mesh nicely with the rest of the Ninth World setting, providing numerous ideas for encounters, adventures and campaigns beneath the sea, while expanding on the description of our planet 1 billion years into the future with more cool, weird aspects. 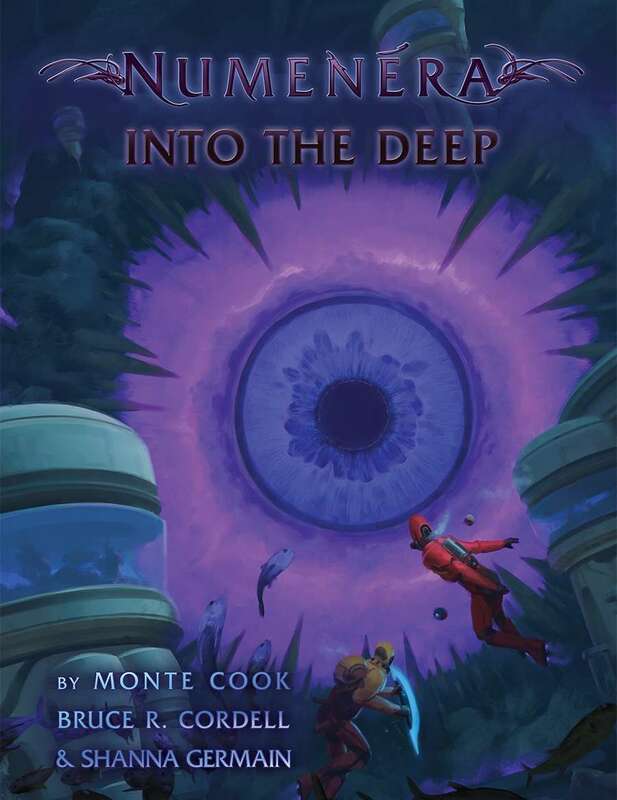 Reading the book was entertaining and inspiring, constantly evoking the sense of wonder I love about Numenera. I wished the book was a bit more extensive in general topics like seafaring in the Ninth World, weather and other strange phenomena or modular encounters that seafaring characters might encounter above sea. I also would have liked to see some more "mundane" plants, animals, etc., but the focus of the book lies on providing adventure locations instead of beeing a guide to sealife in the Ninth World, which is okay. ...See more /> I can absolutely recommend Into the Deep. It ranks on par with the Ninth World Guidebook in my personal hall of Numenera-fame. The book is great especially for GMs - although players might be spoilered by stumbling about the secrets of the different locations.